On today’s show Marc and his co-host, Anthony McCarthy, host of the Anthony McCarthy Show, on WEAA will be listening excerpts from three different conversations with the central theme of farming and food sovereignty in the African American Community. 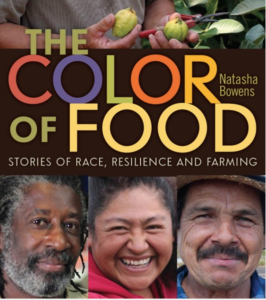 We begin with an excerpt from Marc’s August interview with author and photographer Natasha Bowens, about her book The Color of Food: Stories of Race, Resilience and Farming. From the website: “The Color of Food“honors, preserves, and amplifies the stories and beautiful faces of Black, Native, Asian, and Latina farmers and food activists across the country.” We’re also joined by local farmer Denzel Mitchell of Five Seeds Farm and Apiary in Baltimore to talk about the ways that race intersects with agriculture and the food movement. This week is the WEAA Fall Membership Drive, so tune in for compelling topics and wonderful premiums! Now is your opportunity to support the station you have come to love: WEAA, THE Voice of the Community. Call 410-319-8888 or visit weaa.org to make your pledge of support during the show.